Faced a problem, I can not find a solution. I have never come across this before. With great difficulty, I was able to complete the project with different results between the viewport and the rendering result. Faced the same problem, I think I solved the problem by setting the camera tonemapper to Linear with a value of 1, unchecking Auto Brightness and using Blender's tonemapping settings instead, just as Charles did in his Food scene. I don't know if this is the most correct workflow as I'm pretty new to LuxCore. In my scene, everything is done that way ..
Or I misunderstood the translation with the help of Google translator. Then I have no clue about what might be going on. Just to illustrate my point here's a screenshot of my own viewport using the settings I mentionned. Unless my eyes are fooling me everything seems to be in order. please watch my scene. try to do in it? At first I had the same problem as you do, but everything went fine in the end. Your cameras may be overlapping, I really can't tell actually as I am a total newbie to LuxCore. You may want to reset your layers or cameras to default settings. Not sure what you mean? There can only be one active camera, so it doesn't matter if cameras overlap? Sorry for that, I meant that there might have been one camera with some settings active in the viewport, and another one in the same place to be used in the render view. 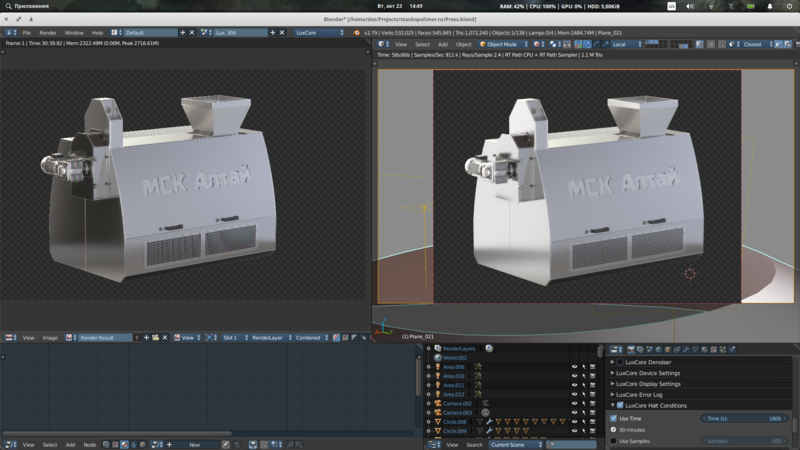 One camera renders the viewport, and the other one renders the render view. I think this is not possible in Blender. There is one active camera, and it is used in both viewport and render. Very nice of you for posting the scene. Took a quick look and it seems either there's a bug(?) with Area Lamp > "Visible to Camera" doesn't work! hopefully someone knowledgeable will chime in.